If you’re as lucky as we are, you know a Girl Scout who’s already delivered your boxes. 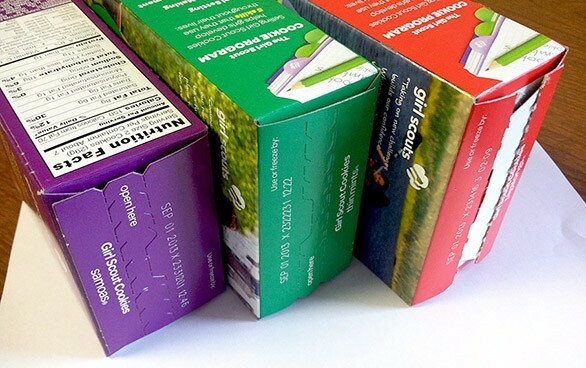 Starting tomorrow, you’ll start seeing serious little businesswomen decked out in brown and green — don’t call them cute — happily relieving you of your dollars in exchange for bright boxes of Thin Mints, Samoas and Tagalongs. Yes, it’s Girl Scout Cookie time. Booth sales begin tomorrow in our area at grocery stores and other spots, all listed here. (Or download the official cookie-finder app.) But if you’re traveling between Coeur d’Alene and Spokane, you might notice a curious difference in cost: It turns out Girl Scout cookies are one vice-like thing that costs less on the Spokane side of the state border. The Girl Scouts of Eastern Washington and Northern Idaho set the price at $4 this year. But, because of sales tax, a box in Idaho actually costs $4.25. Only Idaho and Hawaii tax the sale of Girl Scout Cookies, and a bill in the Idaho Legislature aims to remove Idaho from that very short list. Earlier this week, the state House passed the bill that would exempt Girl Scout Cookies from the 6 percent sales tax, with a large group of Girl Scouts watching from the gallery. But the bill faces an uphill battle in the Senate, where the top Republican isn’t thrilled about granting tax exemptions to organizations just because they ask for it. Although prices per box do vary, the $4 price point seems to be pretty standard. About $1 of that cost is for the cookies themselves, with the rest going to Girl Scout programs. Wherever you end up buying them, remember that Girl Scouts warns that cookies for sale online “should not be purchased under any circumstances.” They can’t guarantee the freshness or origin of those cookies and, not least, those sales don’t benefit the girls at all.